Grottyness, grottyness, grottyness. The cold I've had for over a week finally decided to wipe me out yesterday. It probably didn't help that since I caught it I was rushing round at work like a mad thing when the cold was at it's worst for snottiness and coughing. Anyway, yesterday saw me with sub-zero energy levels and today I was only just into positive energy territory so I've been stuck at home. Hopefully tomorrow will see me back at work. These were all assembled and primed by Tuesday night. Today I've given them a basecoat of yellow ochre. Once that had dried, I did the first layer of camo (3:1 burnt sienna/yellow ochre) applied using a sponge. I've given the stands a base coat of burnt umber. Later tonight I might do the second colour of camo (3:1 sap green/burnt umber). 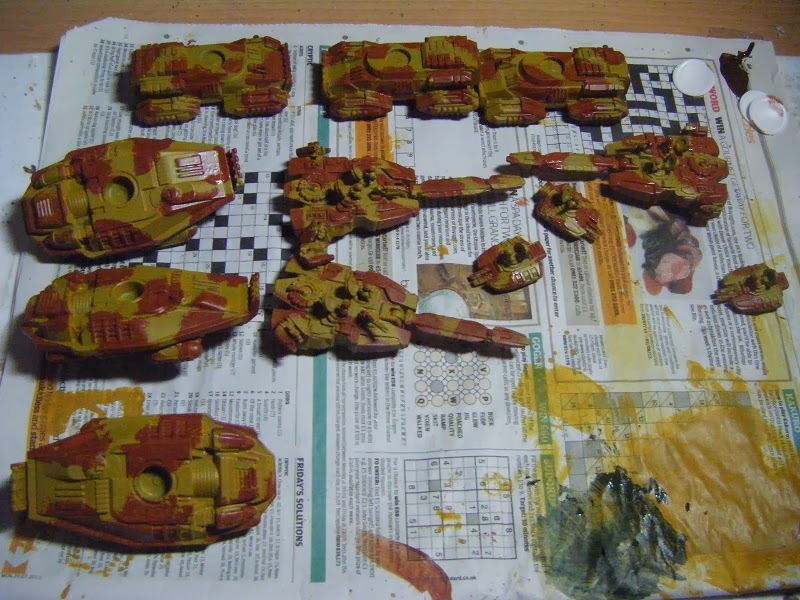 Then it will be a wash of burnt umber and doing the detailing (crew, weapons, grav modules). I missed out one fact from my post on Sunday. While drilling out the holes for the flight stand pegs I made a booboo on the heavy cruiser and accidentally drilled too far through. I've plugged it with squadron green putty and drilled a new hole just to the side. The ships have all been washed and the battlecruiser assembled (which only involved gluing the bridge section to the main body) and they are ready for priming. I'll try to get them painted up this weekend. Having stripped the paint off these last week, I've now reassembled and primed them with the howdahs left separate for now. I've prepped the 4 standard bearers I bought for my Buccaneer army and washed them. I still need to add some wire for the flag staffs and then prime them. I started prepping these at work this week and they are sat on my desk at the moment waiting for me to finish prepping them. I've begun prep on these. Holes for flight pegs and the engine exhausts have been drilled out. Unfortunately all my needle files are at work so I won't be able to prep them for a few days. 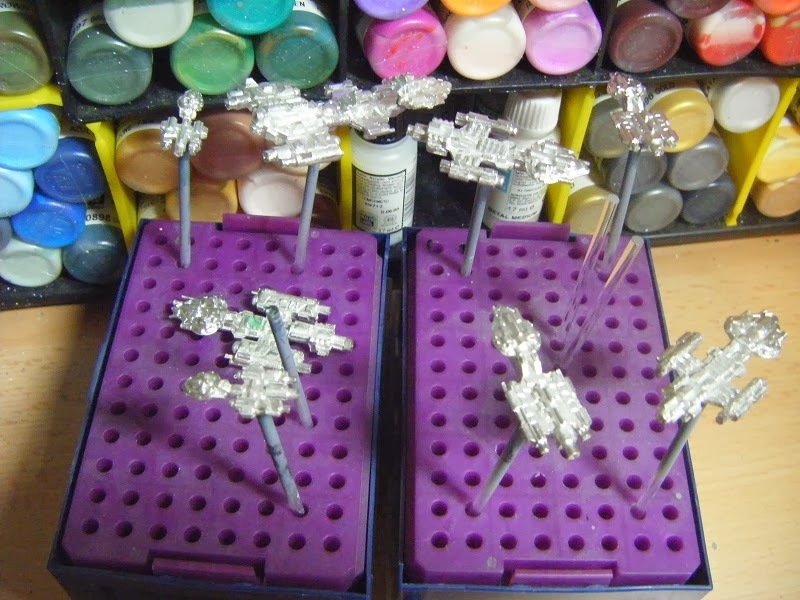 GZG - more ships for my NSL fleet and some 15mm NAC power armour troops. Tiny Tin Troops - a whole lot of magnetised bases for my 6mm ACW project. Figures in Comfort - some pick'n'pluck foam trays for storing and transporting my Full Thrust fleets and a load of Litko tokens and bits for Full Thrust. I've had a grotty old cold all week so there wasn't much to post until now. Whilst I might not have done any painting until this weekend, I wasn't doing nothing. The nelliephants have been stripped and reassembled - I'll be painting them with the howdahs off this time, then gluing those in place later (before the Klear/ink and matt spray). As well as stripping the nellies, I also stripped the FSE intro fleet which I'd painted about this time last year (but hated the paint scheme). After a bit of fannying about, I repainted them over the weekend. Hmmm, I guess I never took pics of them in the finished state.I had picked out weapons and some panels & pods in white, red and yellow. These ended up somewhat darker than I originally envisaged, but I'm pleased with the result. I was also reminded of the problem with my photography set up. For some reason the matt black boards and my lighting combine to white-out the ships in my photos, so I ended up going with the glossy white boards. As well as this, I've done a bit more prep - the NAC intro fleet I won in Seb's prize draw and some grav tanks and grav APCs from Critical Mass Games. The tanks have been washed and assembled (apart from the gun barrels - I'm still trying to work out whether to fix the barrels or go for magnetisation so that I can swap them out). The APCs are currently soaking in soapy water to remove any release agents from the resin. I'm still trying to work out a running order for what I'm going to paint this year. Curt's introduction of fortnightly specials has thrown a bit of a spanner into my intentions from before the call went out. I can't see myself entering for all of the specials, but I should be able to do something for the non-combatant, vehicles and casualties. I'll also need to find something for my entry fee. I had thought of doing a certain iconic vehicle from a certain iconic film developed from a certain song but haven't had any joy finding a model in less than 1:12 scale! This means I'll just have to find a 28mm figure that would fit the requirements (inspired by a Peckinpah movie). So, I guess you all want to know what I'll be painting for this year's Challenge. "Arrrrrrr! There do be pirates on the horizon Cap'n!" Yup, my 15mm buccaneer army will be hitting the painting table. Lots and lots of bloodthirsty, cutlass-wielding, grog-drinking ne'er-do-wells. 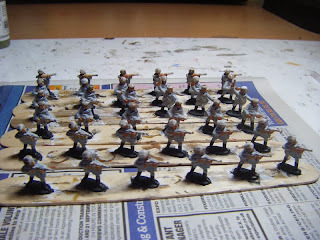 6mm ACW - it's been just over 2 years since I bought the base armies so it's about time I painted them. 15mm SciFi, as Curt is allowing non-historical minis this year. I haven't decided which ones to do yet (so many to choose from!). I will probably try to tie this in with the Vehicles special and do a reinforced platoon sized force. 28mm Coureurs de Bois - the FIW figures for the Bloggers For Charity game (if I haven't painted them before the Challenge). 15mm 30YW - I've got 6 limber teams, 32 casualties (24 men, 8 horses) and 10 battalion guns to complete my army. Guess which special I'll try to tie these in with! If I manage to get through all those, I do have some more things waiting in the wings, but I haven't prepped any of these. I don't think I mentioned it in my posts earlier this week, but I've been painting up my Norman Dux from Conquest Games since finishing Simon's Spetsnaz. By the way, I handed them over to him on Thursday night at the club and he was mightily pleased with them. Anyway, back to the Dux. I went for a full-on 3 (or more) layer approach for most of this and finished painting him last night. Then I made the mistake of doing a Klear/ink coat which has obscured some of the highlights and shading. IT still looks good though. 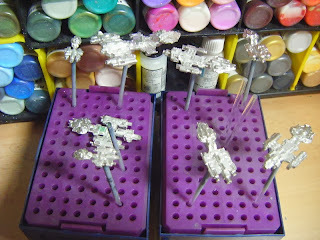 Today I've sprayed with matt varnish, then used brush-on satin varnish on the horse flesh and some of the metalwork. Then I finished off the basing with tufts and flocking. I had planned to go to Warfare in Reading yesterday or today. Yesterday I was still tired (very busy week at work) so intended to go today instead. Unfortunately I seem to have picked up a cold which kicked in late last night. I was no better this morning, so no Warfare for me. There were a few things I had wanted to pick up, so I'll just have to order them online. 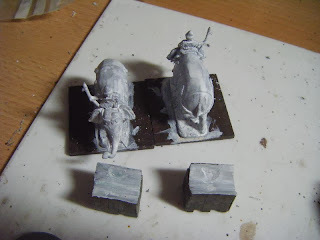 Next up on the painting table will be the Seleucid elephants, followed by the Xystophoroi cavalry. Well, this is more the prologue than the beginning - that's a month away. 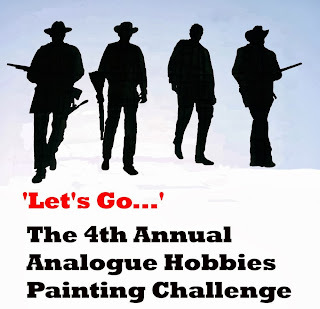 Curt has announced the 4th Analogue Painting Challenge which kicks off on 15 December and ends on 20 March next year. Yes, three months of painting hell like a mad thing. There are 50 places available, with previous entrants getting first chance. If you fancy joining in, pop on over (link in the piccy above) and leave a comment. The entry fee this year is a 28mm figure inspired by a Sam Peckinpah movie. There are also some fortnightly themes this time which can earn you bonus points. Added to all that, this year is open to SciFi and fantasy as well as historical. I'm entering again this year. I don't plan to go as mad as last year as I suffered painting burnout afterwards from doing so much over such a short space of time. I achieved a final tally of 1970 points last year which put me into 7th place. I think I'll set myself a target of 1200 points this time - that should be achievable and will stretch me to paint a bit more than normal, but is unlikely to burn me out. I finished painting these last night, but had to wait until this evening to give them a coat of matt spray varnish. Doing the camouflage was a bit tricky, mainly because I didn't want to overpower the finished look but still wanted to get the right effect. I think I've got it about right. My only qualm is the mid-tone of the camo - I think it should have been a little darker, but it looks OK. So, lots of pics for you. I haven't taken shots of all the figures as there are only 5 poses. Now that they are varnished, I'll be popping them off the painting sticks and packaging them to give to Simon at the club, probably on Thursday night. Oh, well. I did take my camera to the club on Monday but forgot to take any pictures of the game, so I won't bother with an AAR. I've been feeling tired every evening this week, so haven't made any progress on painting since Sunday night. I had managed to get a decent way through the Spetsnaz figures though. I'd previously done the base colour for the uniform. On Sunday I painted the flesh, hair boots, hood lining and the classic blue/white hooped T-shirt for figures where it was showing at the neck. Given how tired I've been feeling all week, I'm going to have to give Blog-Con a miss. I had been planning to go up for the Sunday, but I'm probably best off catching up on sleep. To everyone who is going, I hope you all have a great time. I did mean to post during the week - honest! - but never got around to it. Hopefully I'll get back to posting more often from now on. Anyhoos, this week I've managed to get quite a bit done. 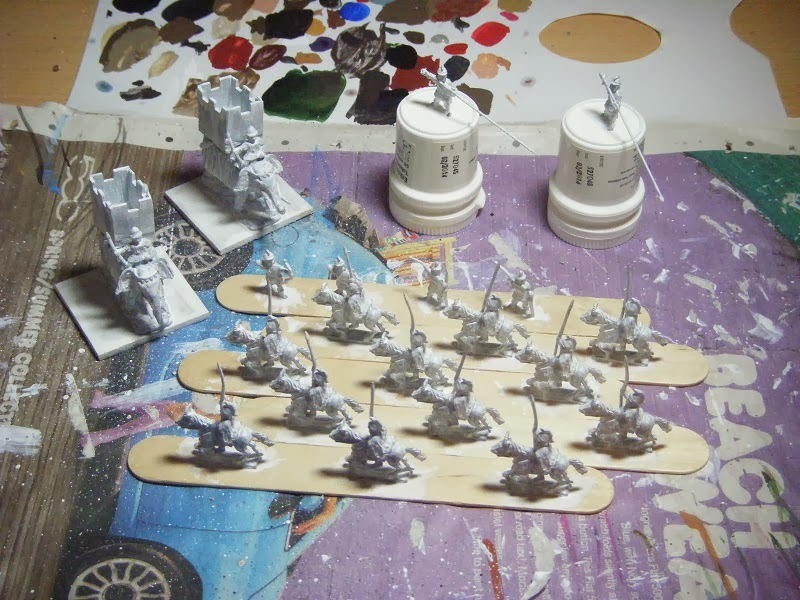 The Seleucids have been prepped and primed. I did have an accident with one of the pikemen for the howdahs - the arms were slightly out of line for holding the pikes, so I was gently bending them when one snapped at the elbow. I gave up trying to fix it back in place, mainly because it pinged out of the tweezers I was holding it with and I then couldn't find it. Instead I glued the pike in place and sculpted the missing arm with Squadron Green putty. It looks a little bit rough, but hopefully won't be noticeable once it's crammed into the howdah with the other figures. And these complete the figures Donogh sent me. I finished painting the final two last night. Today I sprayed them with matt varnish then went over parts of them with gloss or satin varnish to make them "pop" a bit. Before the zombie plague struck, Ken was the private security officer for a small gated community. Previously looked down on by the wealthy residents, his position has reversed and he has become their effective leader as he was the only one with any military experience and knowledge of weapons. Dionne was a big fan of the Matrix movies and decided to go for the "Trinity" look when the outbreak struck. Having been on the school gymnastics team, she easily learnt how to do fancy martial arts-type spinning moves whilst firing her two automatic pistols. Sadie was always reading detective stories as a child and has become very much the investigator of the community, making forays into the nearby city's public buildings and abandoned military bases trying to unearth clues and materials that will help the community survive. She managed to find a silencer for her machine pistol as she doesn't want the sound of shooting zombies to attract others - this has helped keep her alive on more than one occasion. Twelve-year old Alex is the only daughter of a wealthy Chinese family and attended the local private school. She was always a bit rebellious and very into rock music (anything to annoy her parents) but still loves her cuddly toy panda. Oakley was an outsider who helped rescue a foraging party from the community and was invited to join them - anyone who can hack zeds with an axe or slice them with a katana whilst shooting others with a shotgun is more than welcome. However, his background is still very much a mystery. Where did he come from? Why does he hate the zeds so much? I've actually has great fun painting all of these up for Donogh, despite the challenges of being pushed far beyond my painting comfort zone. I'll be packing and posting them off to him this week. Tomorrow night I've got another practice game for Usk and I will try to take pics and post an AAR this week. 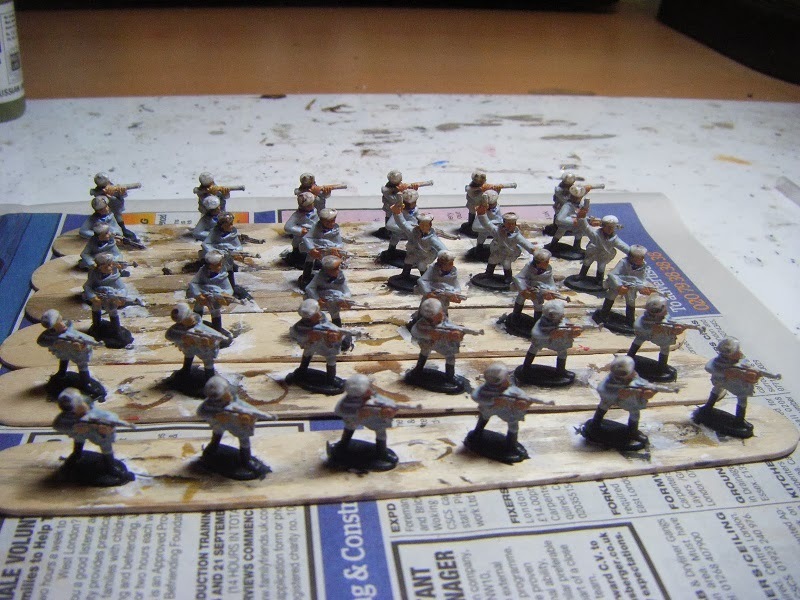 Now that Donogh's figures are finished it will be Simon's Spetsnaz that are next up on the painting table. If I'm lucky I'll finish them by next weekend. I'll also be trying to get the rest of the Sarmatians prepped.